End of 43rd Entry: Then a boat hoisting sail set her course for Table Bay. Instantly the fleet ceased its fishing and in a few minutes, every boat was racing for the markets. 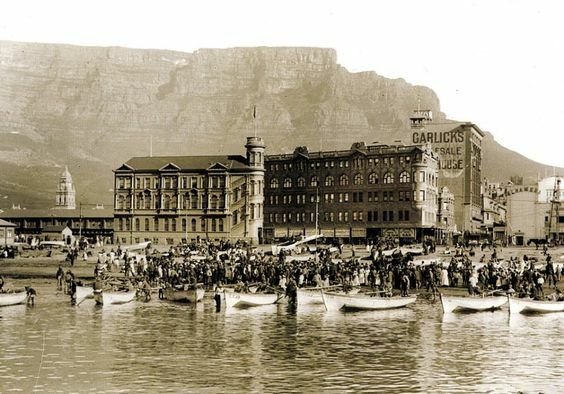 The Easterly wind had dropped soon after snoek had been biting and until noon the sea was like glass – as soon as the boats started off home, however, a strong Westerly wind was coming down, and with a good beam wind the ‘Violet’ went crashing Sou’ West through a welter of rushing white horses. Soon the coast a mass of black jagged rocks rose threatening before her, but the skipper held on till near the breaking surf – then round into the wind swung the boat, hesitating a moment with fluttering canvas – the headsail filled and bore the bows round, and as she paid off the mainsail swung over, filled – and off went the ‘Violet’ roaring out to sea aslant the wind. When well to the windward of the snow-white beach at whose edge the ‘Alice’ was already lying Violet’s skipper once again brought her head into the wind, round she came and with sea and wind behind went flying down on even keel and a little later a merry crew were casting fish after fish on to a pile. 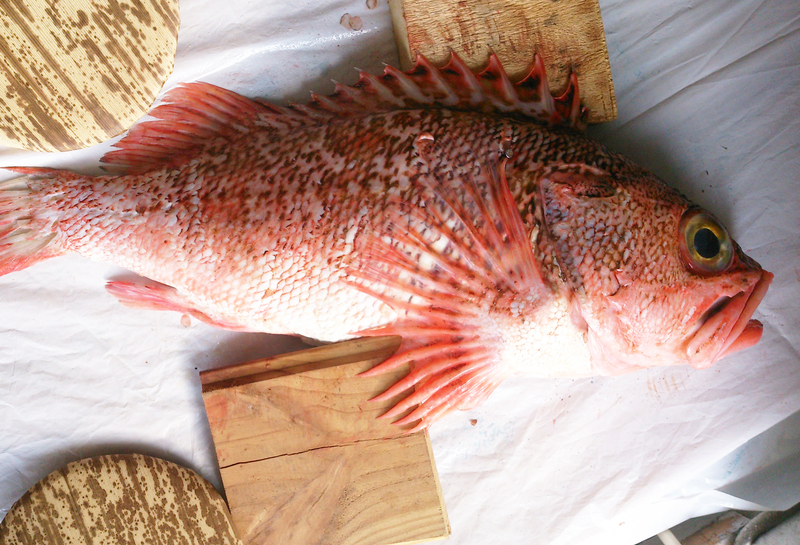 When the catch was altogether the crew shared equally, this done each man threw an eighth of his share to go to the boat’s owners. “Me give twenty-five!” but eventually he paid thirty and retailed the lot at £2/5. 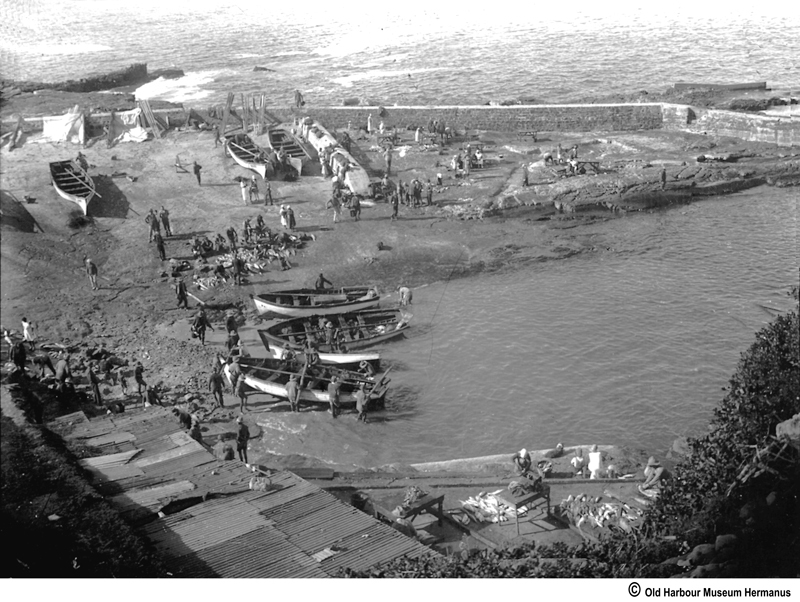 End of 42nd Entry: There seemed no bottom to the sea – fathom after fathom of line ran out – however the rush of line at last slackened and gently hauling in the fishermen got the true depth and slowly raising and lowering their lines kept the baited hooks a foot or two from the ground. Suddenly Mick felt an added weight to his line – instantly he struck hard across the gunwale and began hauling in with heart and soul. Now and again he felt the weight stirring feebly but there was no live, fighting demon, hooked only a solid mass it seemed. An eternity of hauling and a big-headed, slimy bodied fish came to the surface and began to make a weak attempt to struggle – lifting it into the boat Mick swung it between his knees picked up the cudgel at his feet and with a smashing blow stunned it. Unhooking the fish he rebaited the hook and dropped the line overboard. Dawn was slowly breaking and now and again one of the crew hauled in a fish, but it was deadly slow, monotonous work, and Mick found far more excitement and interest in the distant view of Table Mountain, the surrounding boats and the faraway peaks of the Drakenstein and Hottentot Holland Mountains. At last the sun broke from the horizon and soon after what little activity had been shown by the fish ceased. Boats now began to pull away back to the distant shore and the ‘Violet’s’ skipper with a grunt started to haul in his lines. 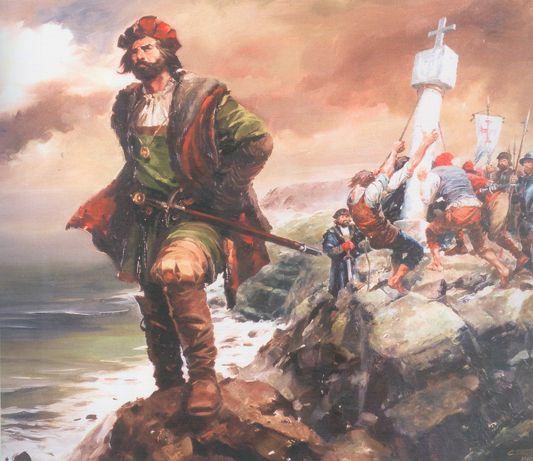 “Three a man and two for the boat – it is good,” he remarked in Cape Dutch. 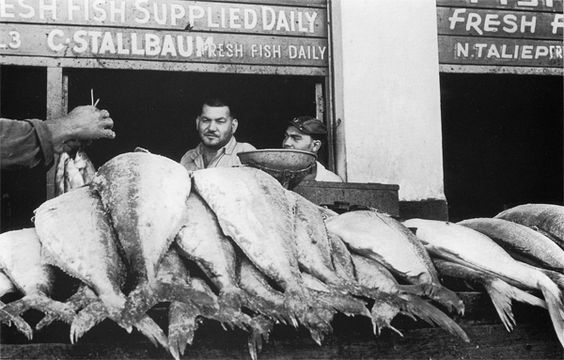 He was satisfied with the catch – stockfish were selling at 1/3 to 1/9 apiece and anything over 3/- per man was a good day’s earnings in the slack season – when the great shoals of snoek came men would earn up to £2 a day – but meanwhile – a few shillings a day from fish, a few shillings from precious mountain flowers gathered at infinite risk and with much labour was plenty. Living cost little or nothing and one could get drunk for a shilling. Life was simple and presented few worries. A light easterly breeze sprung up soon after the stockfish banks were left and as the first cats’ paws darkened the water the mast was stepped – at first the sail made little difference, but it was not long before the breeze freshened, and the ‘Violet’ with added impetus started to forge ahead as the light duck bellied out to the wind. Soon the boat heeled slightly over and her bows diving into the playful wavelets sent a chorus of gurgles and splashes into the soft warm air. The oars were laid in and sprawling on the thwarts the fishermen lit pipes and gave themselves up to slumber, Mick taking the tiller and mainsheet. More to kill time than out of seriousness Mick, finding little to do in the light breeze, opened his line box and fitted a trolling line – a great barbless hook bent on to two feet of stout picture wire softened by fire had a tiny circlet, from which dangled a dozen narrow strips of sharkskin, slipped above it – a long cone shaped lead covered with a burnished brass skin was passed down the wire to hold the lure and help it – making the wire fast onto a strong fishing line Mick flung it overboard, let it run perhaps twenty feet and fastened the line around his leg. Now and again he hauled in and flung out the line but with little interest – suddenly as he was hauling, something swirled at the surface Mick felt the line almost torn from his hands and with a wild yell of “Vas – Snoek you blighters” the youth hauled with might and main at something which fought like a thing possessed. At his shout, the boat’s crew galvanized into mad activity – line boxes were flung open – similar trolling lines to Mick’s hurled overboard and every man began to pull in, throw out, haul back like a set of demons, meanwhile Mick brought a streak of burnished silver with long narrow pikelike jaws to the boat’s counter. The thing fought desperately – it’s back a ridge of cruel spines standing erect, it’s doglike teeth snapping viciously, seizing the wire close to the devil’s mouth Mick heaved four feet of furious fighting fish under his armpit, slipped a thumb into one of it’s eyes, his fingers closing hard against a ridge under the lower jaw and releasing the hook flung it overboard. Bending he picked up the cudgel cracked Mr. Snoek neatly on the centre of his skull and dropping him, grabbed again at his line. The others had not been idle and as the boat sailed easily along her sides were filled with silver flashes. For five minutes the work was fast and furious then the shoal either all caught or diverted by something was lost. Though far from other craft their activity had been seen by some keen Malay eye, and a score of boats turning from the homeward course was racing down, the crews bending backward and forwards like automatic figures. Mick scrambled back to the bows and the skipper resumed his position. Again came the cry “Vas” and once more the crew flung themselves into furious work. Other boats sailed by – some cast anchor and dropped over baited lines and for two hours with brief spells between shoals, the fishermen laboured at gathering the harvest of the sea. Then a boat hoisting sail set her course for Table Bay. Instantly the fleet ceased its fishing and in a few minutes, every boat was racing for the markets. Cape Town slept peacefully beneath the sheltering mass of grey old Table Mountain. Now and again a belated cab or a wagon of farm produce clattered, or rumbled noisily through deserted streets – the tramp of policeman sounded eerily in the stillness. The yellow flashes of his lantern cutting long beams through the air laden with sea and valley mists. 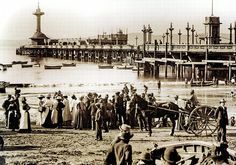 Below Adderley Street, the city’s main thoroughfare, some two hundred heavily built fishing boats lay massed on the tiny beach of Rogge Bay and though midnight had not long passed dark figures singly and in pairs, in little groups were already appearing from the town and gathering in knots around their craft. Soon a move was made – sixteen wiry powerful fishermen collected round one boat – stout poles were slipped through rope nooses in bow and stern – the men lined out four on either side of the bow and four on either side of the stern, bending they got their shoulders under the poles and on a sharp order from the boat’s skipper lifted the heavy boat and staggered down to the water’s edge. Once the work started it progressed rapidly three or four crews combining to carry each other’s craft down. The co-workers tally of boats complete mast and sail wrapped in stout tarpaulin, heavy stone anchors, anchor rope, oars, line boxes, cudgels for stunning fish and other gear were swiftly brought down and stowed – oars were slipped and soon boat after boat rowed into the dark covered night. Two of the fishing craft, ‘Violet’ and ‘Alice’ seemed strangers amongst the rest of the fleet, and no helping hands appeared to be extended to their crew. ‘Alice’ a lighter type than the standard fishing boat presented no difficulty to the two crews easily carrying her down. ‘Violet’ on the other hand was an exceptionally heavy, five-oared craft, and the air around her was sulphurous as seven men and a white youth vainly endeavoured to half carry, half drag her. Explaining his intentions to the others, a wild looking lot of Cape Coloured men, Mick dived into the mass of busy fisherfolk and in the dim light sought for one of the old pureblood Malay skippers. A white-bearded turbaned man, short, stout and evidently of importance was soon found. Gravely the skipper listened to Mick’s tale of woe and answered in a merry full voice “Young Gentleman my people do not like these Clifton people – they are drunken scoundrels and it is not good for young white gentlemen to be with them. However, for your sake, I will give help” and in a few words sent half a dozen Malays to Mick’s help. “Proper gentlemen the old Malay people are” remarked Mick to Jack as they helped stow away the boat’s gear after thanking the helpers. The two boats soon pushed off – their own fishing station was some six miles by land from Cape Town but the previous week a howling North West gale had caught them at sea, and the skipper after a stern battle had turned and run for Three Anchor Bay only to find the surf running too heavily to venture in. Cape Town then remained the only resource so squaring away the two boats went tearing down before the strong wind and heavy following sea. Mick had been in ‘Alice’ the lighter of the two and had found all the thrills he wanted. This time he was pulling the bow in the ‘Violet’ and it wasn’t long before he was cursing freely for the boat was as heavy to pull as to carry. The ‘Alice’ had taken three men beside the skipper, leaving the ‘Violet’ the same number which made her two short for a full crew. Slowly the fishing boat was pulled across Table Bay passing by many sparred Sailing Ships, rolling slowly at their anchorage, under the towering sides of huge cargo steamers, in amongst dainty racing yachts until a mile from the beach they rounded the gates of Cape Town’s docks and entered into a world of ghostly creakings, manifold smells and weird shapes and shadows. Here the fishing fleet gathered under the skeleton arms of monstrous cranes, besides great ocean liners, next to sea battered sailing craft, beside slimy green coated wharvers, and began to reap a harvest of small fish to be used as bait for bigger relations. Holding candles and lanterns close to the surface of the water and liberally sowing breadcrumbs, the fishermen soon had shoal after shoal of a small type of herring swimming up to the lights – a large scoop net on the end of a pole was then brought into play and before long the boat’s flooring boards were covered with beautifully tinted fish. As each boat satisfied its’ wants it began to move off to the far distant fishing grounds. There was no wind so as the boats gathered way, crews settled into the long Cape Stroke each man rising to his feet and with all his weight pulling slowly and steadily until his body sat once more on the thwart and the oar loom was against his breast – the skipper reversing the process and pushing against his oar. The sea, black and noiseless, heaved slowly in mountain-like rollers and deep hollows, but as the oars dipped into the dark water and rose back into the air, molten streams of violet fire ran from the blades. “Terrible lot of phosphorous to-night Jack” called Mick from the bows. “Aye, it will have been that Nor’ Wester done that” answered Jack spitting overboard – “tis a good sign for fish and a spell o’ quiet at sea – it’s pretty stuff. Wish to blazes we could get a breeze though – it’s about ten miles to the Stockfish banks and from there ’bout fourteen to Clifton – Blast fishing I say ’tis a crool hard life – but there’s wuss.” he ended emphatically. “What’s worse, Jack?” asked Mick laughingly. Three hours of hard work brought the ‘Violet’ to her fishing ground an hour before dawn – all around the night was alive with the splash of oars and creak of hole pins whilst muffled voices sounded faintly from the dark. It was too deep to anchor so two men gently held the boat against the drift of current as the other three dropped their thick cotton lines overboard – each line was weighted by a heavy cone-shaped sinker of lead above which there were three immense barbed hooks baited with whole Cape Herring. There seemed no bottom to the sea – fathom after fathom of line ran out – however the rush of line at last slackened and gently hauling in the fishermen got the true depth and slowly raising and lowering their lines kept the baited hooks a foot or two from the ground. The end of 23rd Entry: Mrs Van Zijl felt, knew that her daughter and Mick were enjoying a little boy and girl romance but poor Mrs Van Zijl could gather no proof. One morning a neighbour – a poor man – came rushing over, a child was down with diphtheria – could Mr Van Zijl get a doctor – it was a matter of hours as to whether the child lived or died. “Inspan the two best horses and drive like hell for the doctor Mick” called Mr Van Zijl as he grasped the situation. Helped by Mr Van Zijl and the distressed father Mick took but a couple of minutes in getting two young mares harnessed and in the cart – jumping in the youth cracked his whip, the two fresh horses sprang forward, raced around the corner of the stables and the flying cart took the bend one wheel high in the air. Down the rough farm road tore the horses Mick standing in the cart urging them on with the crack of whip and voice though little well-bred animals needed encouragement. 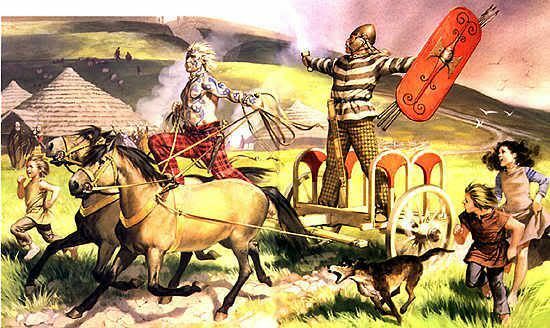 In imagination, Mick was a charioteer of the ancient Celtic tribes dashing through Erin with the news of the Romans landing in Britain. As he peopled his mind with pictures, tribesmen dashing out of villages to watch this mad course, or clearing from the roadway before galloping hoofs of his horses he sang and yelled to the frowning hills and the pitiless blue sky. Soon, however, realisation came that he had fifteen miles to go with a child’s life hanging on his journey and that it wasn’t much use knocking up his horses in the first two, so ceasing his noise Mick began to try and quieten the animals, no easy task but at last successful. Now the first burst of excitement over Mick drove carefully but speedily watching his horses he nursed them on the upgrades, let them out on the down ways, kept a steady swinging trot along the level and then as far in the distance he saw the Dutch Church Spire once more he began to drive madly forward. At last covered with foam, staggering with exhaustion the horses drew up at the doctor’s door. Fortunately, he was at home and on the situation being explained immediately gave orders for his cart to be inspanned and hastily began to make preparations for his journey. Driving slowly up the village hotel Mick took the exhausted horses out, unharnessed them and sent the pair for a walk and roll. Once cooled the boy rubbed their legs down with brandy gave them hot bran mash and then thankfully strolled over to Mrs Scott and her daughter. Warmly Mick spent a pleasant day and evening slept at the hotel and early next morning returned to the farm to find his errand had been unavailing the child having died shortly before the doctor’s arrival. A week later Mick was ill – for three days he lay in bed with a bad throat and racking head – the attention he received was nil – food was brought in at meal times but the lad’s very being revolted at fat pork, greasy potatoes and sweetened pumpkin. Visions of a loving mother and the best of all his pals, his Dad – thoughts of custards, jellies – a little chicken broth, books to read, friends to listen to – Oh but the lad was homesick. Accused of malingering Mick staggered back to work – later returned to his room to find a greatly treasure crucifix on the floor was broken, his kit thrown everywhere – in came Mr Van Zijl raging – Mrs Van Zijl had in her motherly fashion come to tidy the room – by accident a portion of an open letter from Mick to his father had photographed itself on her brain – a paragraph vividly describing the food, the manners, the personalities of Mr and Mrs Van Zijl. Van Zijl white with rage discoursed at length and in detail reviewing Mick’s past, present and prophesying his future – he raised a cruel looking sjambok/whip. Mick with a sailor’s agility leapt out of the window and took the main road to Struan. Five miles on he halted at a friendly farmer who disliked Van Zijl. To an amused Dutchman of the grand old school and to a bevvy of giggling maidens Mick related his experiences. A week later returning from a fishing expedition, Mick’s father handed him a letter. Mr Van Zijl “wished to assure Mr Osmond of his unabated friendship and respect, but at the same time felt it his duty to inform Mr Osmond that his son was an unmitigated liar, was absolutely useless on a farm, was impudent, untrustworthy and wicked. On his own confession, he was in the habit of consorting with Roman Catholics, fishermen and other characters certain to lead even a good boy astray. I would like to thank the photographers and the passionate people who have given me access to photographs from the late 1800s and early 1900s for bringing my grandfather’s story to life. End of 17th Entry: “Come aft and tell me how I must steer to get on the bank.” Quickly working his way back the eager youngster looked shorewards. 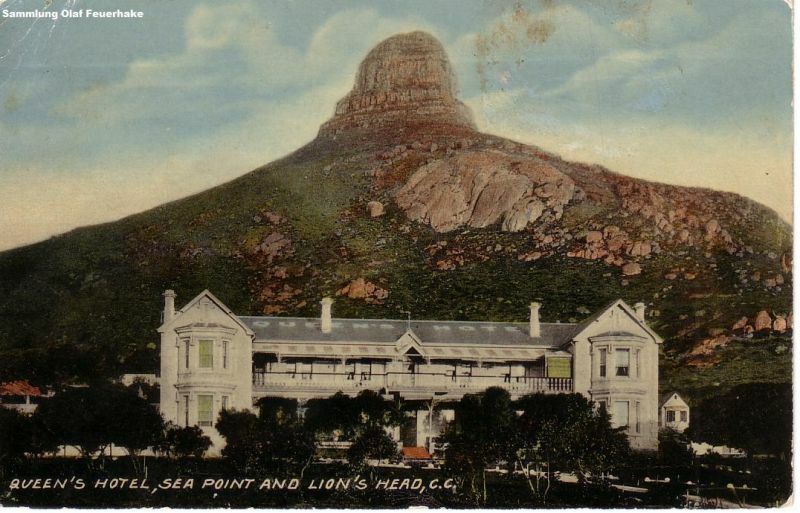 “Yes” answered the boy, his eyes on a long straight cleft in a granite cliff below the Lion’s Head. Across this perpendicular crack was a horizontal cut which tradition asserted had been worked out by the Portuguese sailors of Bartholomew Dias. “All right! Standby to lower” as the crew scrambled to their stations the Skipper put the boat into the wind and at the shout “Lower away!” down came the sail, out went the sprit, the shaking threshing canvas of fore and mainsail was smothered and furled the mast unstepped and the oars out. “Oh! we’ve drifted past the one bearing”, cried Mick. “Pull up Jack! Pull quickly! Koos”. Shivering with nervousness the boy obeyed, a roar from Jack as swinging broadside on the boat skipped a nasty bit of sea most of which got Jack terrified the lad, but putting his weight against the tiller, he brought her head on again – aided by a couple of hard strokes from one of the Port oars. “Standby to drop anchor!” piped the childish treble “Pull her up a bit more. Come on Koos, you’re loafing! Pull! Let go Jack!” and over splashed the stone. “Smartly done me, lad! Smartly done!” said the Skipper laughing as he dropped his line overboard.